Diné be’ iiná, Inc. is a grassroots, nonprofit organization founded in 1991. Diné be’ iiná, means the way that we, the people live. 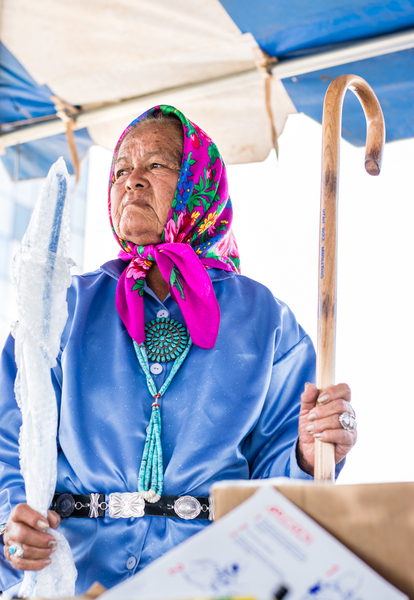 We promote a sustainable livelihood through the Navajo Way of Life. Traditionally, this has been sheep, wool, and weaving and whatever comes from that. Our agro-pastoral lifeway and our Navajo-Churro Sheep evolved in the vast deserts, plateaus, and mountain ranges of Colorado Plateau. For centuries, sheep and goats provided us with economic self-sufficiency. Diné culture and spiritual practices reflect to the ebb and flow of traditional shepherding and weaving practices. Our mission is to restore the balance between Navajo culture, life, and land. We seek to preserve, protect, and promote the Navajo way of life; to encourage the participation and cooperation of the Navajo people among themselves and with other people and organizations; and to engage in research, education, development, establishment and promotion of projects and activities which further these ends. We provide education and outreach to assist sheep and goat producers, and fiber artists sustain economic self-sufficiency. Our curriculum address issues relevant to Dine’ producers. Since 1996 we have conducted Sheep is Life Celebration. This annual event that celebrates traditional shepherding and fiber arts cultures from around the world. While serving all sheep producers and fiber artists, DBI is particularly dedicated to conserving the traditional Navajo-Churro Sheep breed, T’aa Dibei. DBI’s Goals are to restore status to sheep herding, wool processing, and fiber arts, and to promote the education that is necessary for their pursuit. We seek to develop value added sheep and wool products and help producers gain access to markets. DBI’s activities provide leadership, economic development, and support for traditional lifeways of Navajo shepherds and fiber artists. Take a moment to browse our site, see our photos and listen to our story. Contact Us to learn how you may become involved. Be sure to mark your calendar for our annual Sheep Is Life celebration June 2017. Sharing and learning are at the heart of our programs and events. Bring your fiber art projects to work on, have your experience as a shepherd. Discover how much you can contribute!